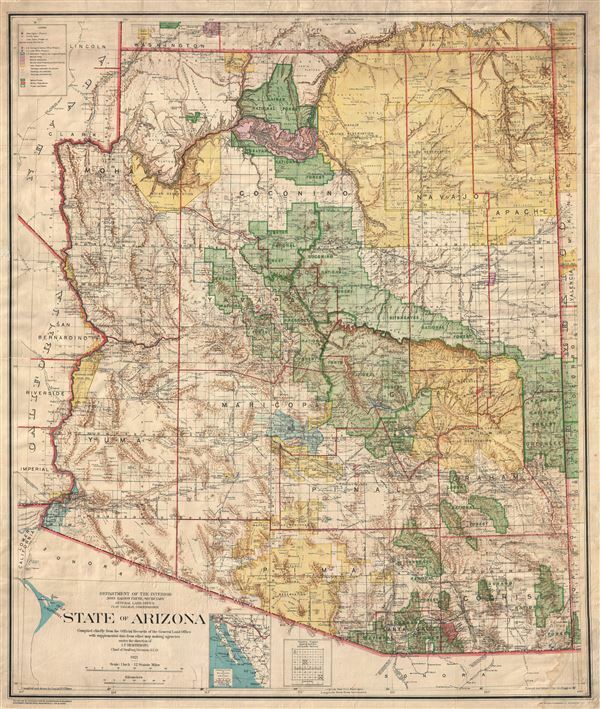 State of Arizona compiled chiefly from the official records of the General Land Office with supplemental data from other map making agencies, under the direction of I.P. Berthrong, chief of drafting division, G.L.O. A remarkable and uncommon 1921 large format map of Arizona prepared by Daniel P. O'Hare and I. P. Berthrong for the General Land Office. This massive map, which covers the entire state as well as adjacent portions its neighbors, is intended to illustrate American Indian Reservations, National Forests, Parks, and other public lands throughout the state. The American Indian Reservations noted and highlighted in yellow include the Apache, Navajo, Kaibab, Hualpai, Fort Mohave, Colorado River, Yuma, Papago, Pima, Gila River, Salt River, and San Carlos. Various national forests are also identified including the Tusayan, Prescott, Sitgreaves, Tonto, Kaibab, Dixie, Apache, Crook, and Coronado, among others. The Grand Canyon, Fort Huachuca, and other federal properties are highlighted in Red. Light blue identified various land reclamation and irrigation projects. Also identified in the Luis Maria Baca Land Grant. This Grant, issued in 1860 to the heirs to the Vegas Grandes Grant (Las Vegas) in compensation for their original lands. The Luis Maria Baca grant became one of the largest private land grants in the United States and, for a time, was the largest fenced property in the United States. For many years it was operated as massive ranch and was the home of the prized Hereford Cattle. In addition to the above, this map also offers extraordinary detail throughout identifying countless towns, mountain ranges, peaks, canyons, notable rock formations, passes, rail lines, dry river beds, dry lakes, proposed canals, and mines. The map was compiled by Daniel P.O'Hare under the supervision of I. P. Berthrong, Drafting Division Chief of the General Land Office. It was printed by the Columbia Planograph Company, based in Washington D.C.
Good. Some soiling and edge wear. Backed on linen. Minor water stain, lower right quadrant.